An Indian Wedding Photographer CT is able to experience a variety of wedding traditions and customs. This Indian Wedding ceremony took place in a Gurdwara, which is a place of worship for those who practice Sikhism. Gurdwara means “the gateway to the guru” and is a place that is accepting of all people, regardless of their religious backgrounds and beliefs. A Sikh wedding ceremony is known as Anand Karaj, which is translated to “blissful union”. A Sikh marriage ceremony is colourful and unique, focusing on the bride and groom who are joined in a partnership of two equals. The entire day is spent in a celebration that can be captured by an Indian Wedding Photographer CT. 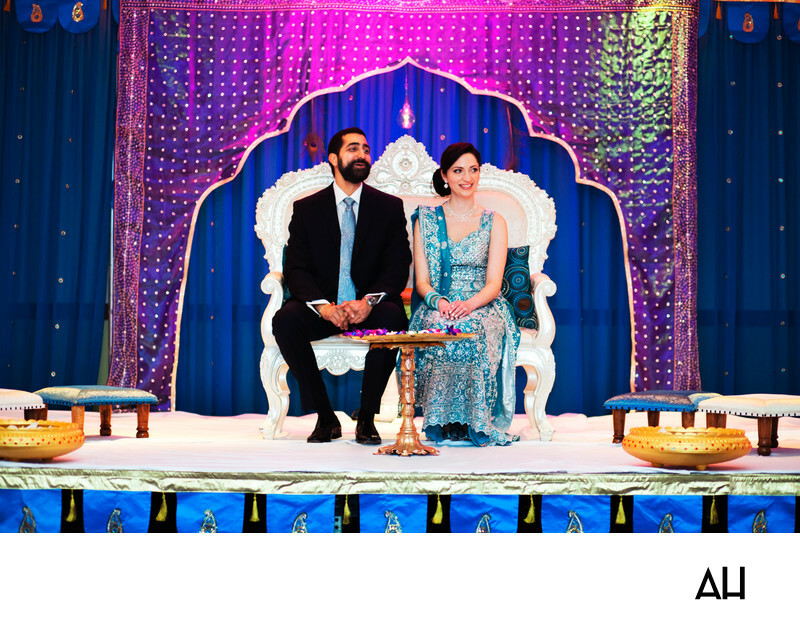 In this photo from a Sikh wedding ceremony, the bride and groom sit on stage before their guests, as regal as king and queen. The colors surrounding them are lively and expressive of the joy that filled their day. A royal blue backdrop sets the tone for an incredibly beautiful scene. A bright pink and gold sheer cloth hangs over the blue, adding to the variety of colors behind the bride and groom. The couple themselves are radiant in their attire as well. The groom wears a classic black suit, but his teal, paisley tie adds vibrance and matches the dress his soon-to-be wife wears. The darker teal of the bride’s dress is covered in jewels that sparkle under the lights of the Gurdwara, matching the sparkle in her eyes. The white floor of the stage highlights the bride and groom by adding perfect contrast to the boldness of the colors that surround them. The image is an exceptionally happy one, only the be rivaled by the moments of merriment to follow at the wedding reception.